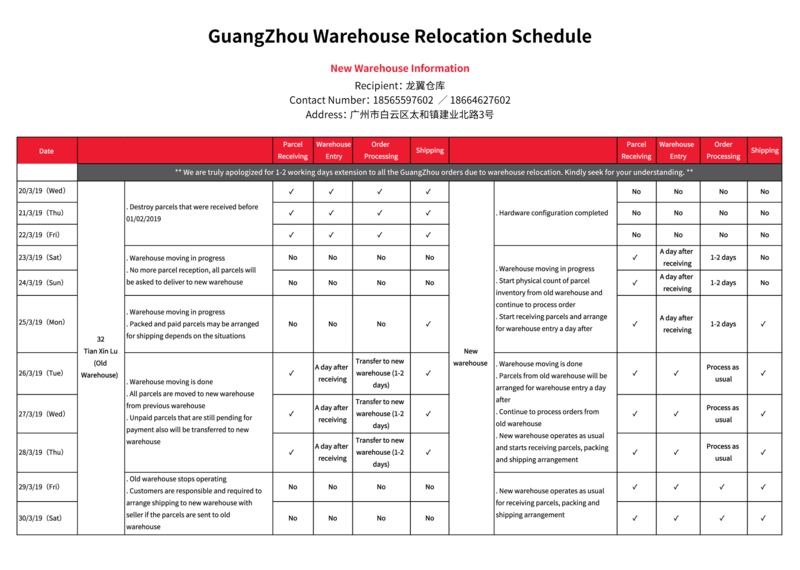 Our Guangzhou warehouse will relocate and start on March 23, 2019 – March 25, 2019 (Saturday to Monday). If you place an order before or after this period, all orders will be delayed by 1-3 days of processing time and 1-2 days of delivery delay depending on the situation. Customers are urged to place orders as early as possible to avoid delays in shipment due to relocation. If you want to know more about the relocation details and frequently asked questions, you can refer to the following to let you know more. 1. After 20 / 3 / 2019, is it possible to place a 1/2/19 or previous package? No, the package has exceeded the number of days of storage and has been destroyed. 2. March 23, 2019 – March 25, 2019, the old warehouse has no parcels and no parcels, no order processing, and no delivery? There were no shipments on March 23, 2019 and March 24, 2019. On March 25, 2019, orders that had been packaged and paid were shipped on the same day. 3. Is the new warehouse the right one for the package at this time? The new warehouse will start to sign the parcel during this time (from 23/3/2019), but the warehousing time will be filled the next day, but the warehouse will be completed as soon as possible. 4. In case my package is still sent to the old warehouse, is it necessary to wait for 1-3 days to process? The old warehouse has been pre-posted to all local couriers, and the local courier will deliver the goods directly to the new warehouse, so your package may be processed on the same day. The warehouse will be processed according to the situation at that time, and the additional services for orders and parcels may be delayed by 1-2 days. 6. Old warehouse, when is the last time receiving goods? The date of the last receipt of the old warehouse is March 22, 2019. As for the chart, the signing on March 26, 2019 to March 28, 2019 is due to the need to provide a buffer period to avoid having to change the warehouse address. 7. After the old warehouse stops receiving the goods, if the customer still arranges the goods to the old address, the customer needs to bear the responsibility? The warehouse will support the cost of transferring the old warehouse until March 28, 2019. If your package is after March 28, 2019, you will be charged for the transfer. 8. When the old warehouse stops working, when does the shipment start? What date of goods will affect? The warehouse is selected to be relocated on weekends and not shipped on Saturdays, affecting the payment delivery date as Sunday/Monday. 9. Will the warehouse relocation time affect my inquiry? 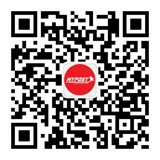 March 23, 2019 and March 25, 2019 – There was no order and parcel inquiry service at the Guangzhou warehouse during this period. The processing of parcel orders will be processed on March 26, 2019.